Chase Field isn’t a bad ballpark, at all. It’s conveniently located within the downtown entertainment zone, adjacent to the basketball arena; it’s steps away from light rail; there are food and drink options in the area (as long as you plan to patronize them before the game, and not afterwards). It is clean and inviting, and very fan-friendly. I would, however, be stretching things if I tried to convince you it was a great ballpark. 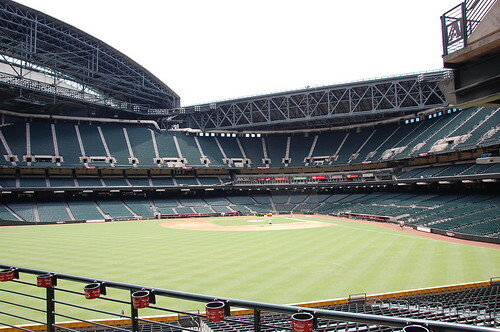 Chase Field will immediately remind you of both Milwaukee and Houston, with the metal-and-dome construction. However, it feels more closed and constricted than either of those two, who have those amazing banks of windows in the outfield to alleviate the I’m watching baseball at Costco feeling. 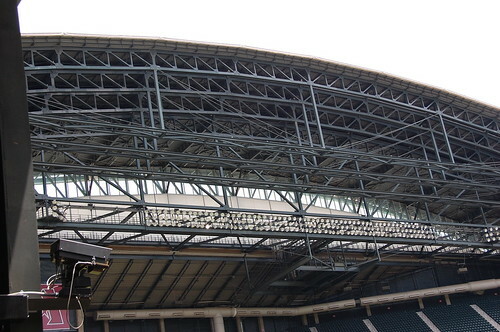 Chase has tiny windows at the top and then the outfield space is taken up by panels, which rotate sideways when the roof is open. I will point out where Houston and Milwaukee fare in my current ballpark ranking; they aren’t big favorites on my list. I’m also not a huge fan of baseball inside, although after spending two days in Phoenix in July, I completely and totally understand that there’s no possible way that baseball could exist in Arizona without an air conditioned dome. This is another park with a true 360 concourse; you’re briefly blocked by the batter’s eye, but otherwise, you can circumnavigate the entire park without losing sight of the field. I found the concourses to be sufficiently wide, but, again, a little dark. (I don’t know how you fix this, Houston and Milwaukee have the same problem.) The lower seating bowl was pleasant, even in the outfield, but I wasn’t a fan of the upper levels; the topmost deck, especially, was very, very steep. 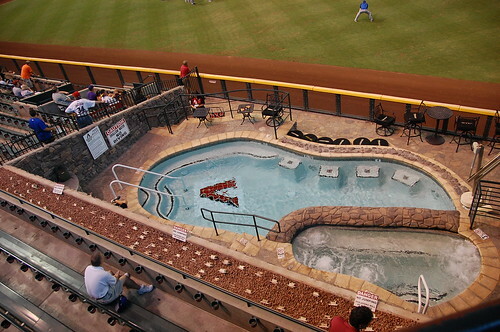 Everybody knows about the pool in the outfield; in person, it’s still pretty cool. We had a friend with us who, by the end of the series, was vowing that the next time he came back, he would organize enough Mets fans to rent out the pool area. Phoenix had, hands down, the nicest people I have ever encounered working at a ballpark, from security to the people at the food stands to the ushers. Given that going to a game at my home park is like walking into an armed camp, it’s always a refreshing change to feel like a welcome guest. 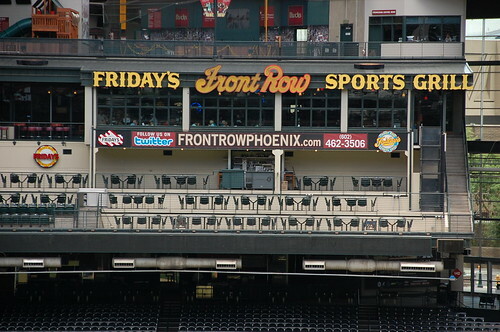 The Diamondbacks do a lot to make their fans feel at home and to make the ballpark experience pleasant. They’ve turned the right field seats into “Uptown” for Justin Upton, and sell tshirts and tickets for that section on a Friday night. 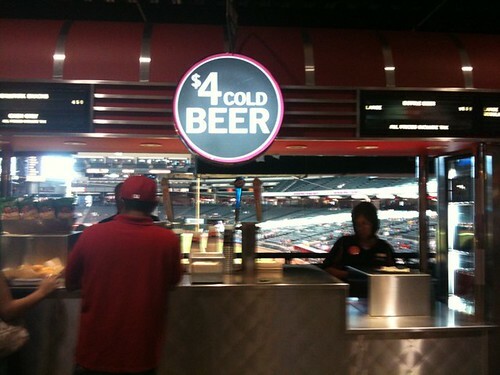 They have $4 items all throughout the ballpark, including a $4 beer. Now, that beer isn’t served in a thimble, and you’re not just limited to the water-that-tastes-like-beer, you could even get a Leinenkugel for $4 if you wanted. I liked that a lot. I appreciate the parks that let people bring their own food and drink to the game, but sometimes, you just want a refreshing adult beverage, and the Diamondbacks make that within the price range of most people. The mascot is D. Baxter the Bobcat. He was not my favorite mascot I encountered this trip. He was like an energetic college cheer squad leader in a fox costume. In case you are wondering why the mascot of the Diamondbacks is a bobcat, it’s because no one could think of a way to make a snake cuddly. If you put arms on a snake, you have a lizard. 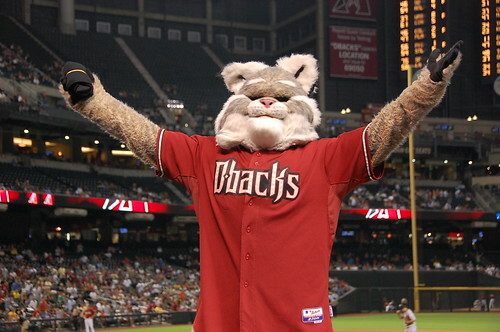 Finally, the child of one of the early Dbacks players suggested the bobcat, as a native Arizona species. It would probably be okay if it actually looked like a bobcat. 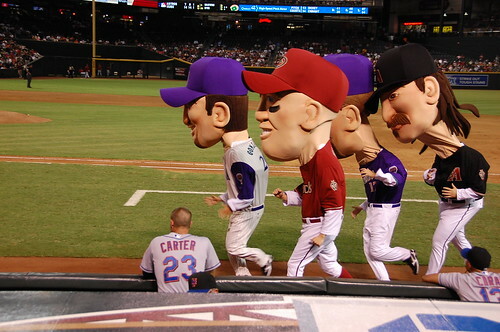 Blatantly stealing from the sausages and the presidents, Phoenix now races giant oversized characters of legendary Dbacks players: Mark Grace, Luis Gonzalez, Matt Williams and Randy Johnson. Nothing you have read about this will prepare you for it in person. Nothing. The only saving grace (hah!) is the reaction of Mark Grace, up in the broadcast booth, to the performance of his representative in the Legends Race. The sign he held up one of hte nights we were there read “PATHETIC”. 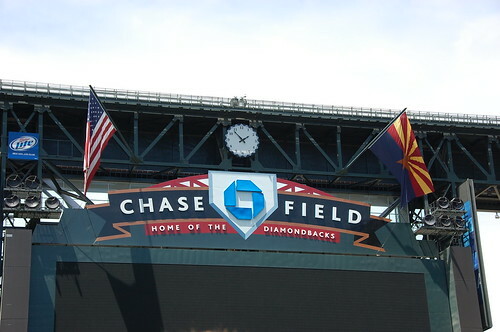 The scoreboard was reasonable, and while I always prefer to see more team logos when I look at the outfield, the Chase Field logo was of a reasonable size and in good taste. 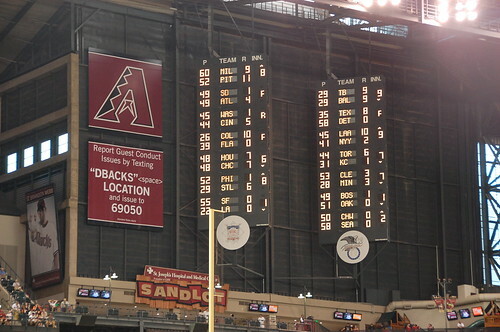 I appreciated that there was a prominent out of town scoreboard that didn’t get lost between innings for advertisements and promotions, which seems all the rage these days. There are a lot of food choices at Chase Field. You can get your traditional ballpark food, you could eat at the TGI Friday’s out in left field (which is open during the day and outside of baseball season) or you could have some fast food Mexican at a place called Macayo’s. No, it was nowhere near authentic, but it was inexpensive, and delicious. I ate there both nights of my visit. 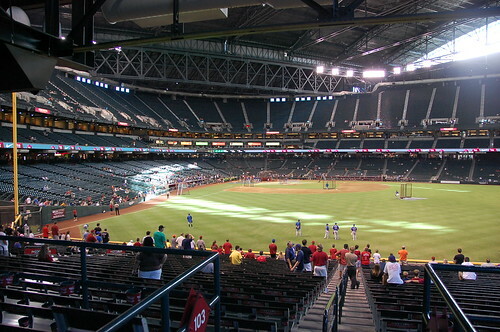 Batting practice access is not restricted; you can fight your way behind the dugouts along with the professional autograph collectors who take advantage of the fact that they’re in Arizona and don’t have much competition. The ballpark tour is reasonably interesting, and does get you access to the Dbacks’ dugout; you can put a foot on the warning track. This was the first tour I have been on where, instead of clubhouse access, you’re shown a film about the clubhouse. I found that to be a reasonable alternative. 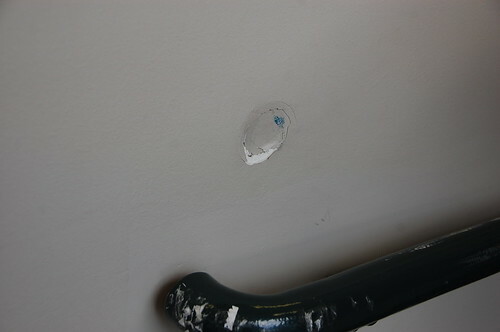 I appreciated the guide pointing out the dents in the press box wall from errant foul balls. 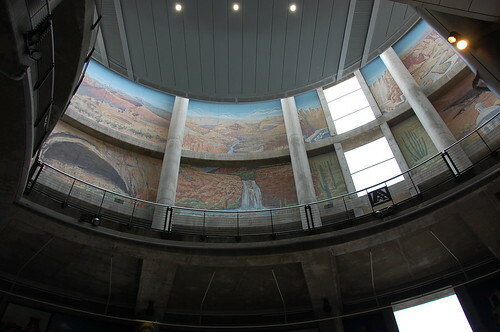 They are very proud of the architectural features of the ballpark, but it’s hardly like a San Diego or a Minneapolis where they brought native materials (or materials meant to echo native materials) into the ballpark structure. 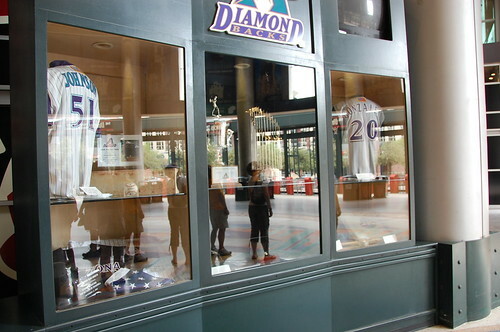 I also very much appreciated that what few artifacts the team had from the post-season or other exceptional achievements were in the main rotunda, available for anyone to see at any time while the park is open. I actively dislike teams that hide their World Series trophies in the premium club area. That trophy belongs to all the fans, not just the ones who can spend thousands of dollars on tickets. The bullpens are along the left and right field lines, and there is seating above each one and you are not prevented from going over there before the game starts. 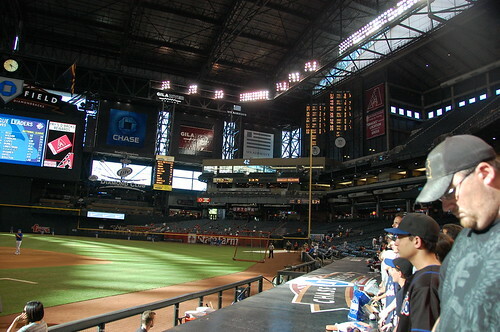 When the Dbacks win – which, unfortunately, they did at both games I attended – you will be serenaded out of the ballpark with a song about the Dbacks. While nothing comes close to the putridness of the Marlins song written by Scott Stapp, the Dbacks song makes “Go Cubs Go” seem like “River Deep, Mountain High”. To be fair, the song was written by a local band of some acclaim, Roger Clyne and the Peacemakers. By my usual musical standards, this tune is impeccable. I might also feel better about it if I was local or if my team had not been ingloriously trounced by the Diamondbacks. I am sorry, but not surprised to report that I would rate fan knowledge in Arizona as very, very low. Despite signs requesting fans to honor inning breaks, there was zero cognizance of what was going on on the field, and this was sitting four rows behind the visitor’s dugout. It just felt like people were not paying attention, at all, because they didn’t know what to pay attention to. Vendors were required to hunch down and be as inobtrusive as possible, but people felt that it was perfectly acceptable to stand up in front of me and carry on a conversation when there were 3 outs and the count was 3-2. People wearing full out Dbacks gear were hard pressed to answer basic questions about the team. Of course, I know this is not representative of the entire fanbase, and sometimes sitting closer to the field puts you near people who aren’t there for the game at all. 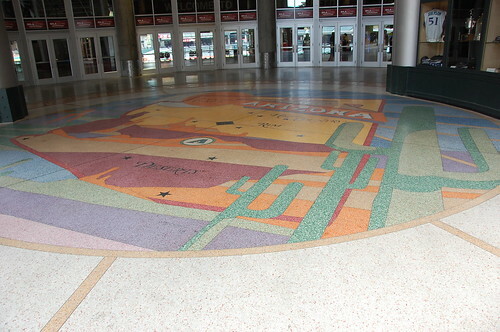 If you visit Chase Field, you can stay downtown, within walking distance of the park, or you could do what we did, which was stay out near the airport and take the light rail in. The light rail was lined up and waiting to go after a 14 inning ballgame – I appreciated this, because this is the type of thing that encourages fans to take public transportation instead of driving. What I didn’t appreciate was how everything around the ballpark was closed at 9:15 at night. The first game we attended was a shutout that quite literally was done at 9pm. We headed over to Alice Cooper’s bar/restaurant Cooperstown, only to find a sign indicating that while the bar was open, the kitchen had already closed. Calls to other establishments in the area also indicated that they were no longer serving food. I know it was a Tuesday night, but – really? The obvious warning: it is hot in Arizona, hotter than you will expect unless you are from that part of the country. Even though the park is air conditioned, it is not as cool as, say, Houston, and you should continue to drink a lot of water. I did not hate Chase Field but I did not love it; I do not know that I would return for a series without another reason (like a concert) to be in town. It’s a short flight from Southern California and could easily be combined into a multi-park trip, which would be my recommendation. MOVIE NIGHT AT CITI FIELD. Sorry that you had a (rough? 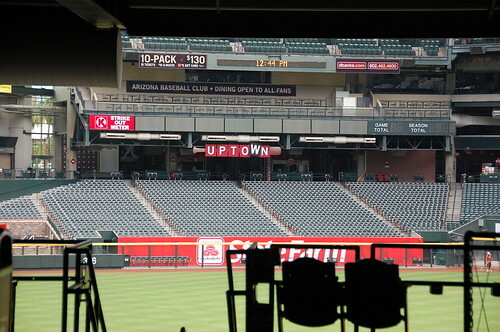 )visit to Chase field….hopefully you will come back to visit again….I’ve lived here since 2004 and love the fact that they put the stadium almost in the middle of the entertainment section of the city. No, I don’t work for the team (one can wish, however)but do return someday. If you get a chance to meet Gonzo, please do. He’s one of the nicest players you will ever want to meet.